Seeing many railroad-themed holiday cards featuring a train passing through a snowy scene, sometimes stopped at a warmly-lit depot with steam rising from around the locomotive, has gotten me thinking about how closely tied railroads are with the places they inhabit, and how the sense of a particular railroad place defines how we fans, historians and appreciators relate to our favorite steel thoroughfares. Railroads revolutionized travel and commerce and forever altered the physical character of human settlement precisely because they annihilated space. Trips that once took weeks suddenly took days, and trips that took days took mere hours, upon the completion of rail lines. Distance was no longer a major barrier to both economic and cultural interaction between disparate parts of continents. Nevertheless, railroads themselves are intimately tied with their surroundings. New Hampshire's Mount Washington Cog Railway, date unknown. Photo from PublicDomainPictures. As powerful, exciting and fascinating as the equipment, structures and technologies are in and of themselves, the sight of a train traversing a track, of a signal tower, or yard or station or roundhouse would lack most of its character without its setting, be it a river valley that guides the track on the gentlest grade, the wide open plains, the thick forest, or the cityscape that the railroad itself gave rise to. Try to picture rails and crossties, a train, or any railroad structure in a vacuum or in outer space, without any surroundings, and you’ll realize just how much their setting defines these elements. Another indicator of the importance of setting is the degree to which model railroading revolves around recreating the physical contours of the scene and the non-railroad aspects of the places through which a railroad would pass. Consider what percent of a modeler’s budget is spent on landscape and architectural elements versus the trains, tracks, switches and electrical systems. My earliest memories of watching and riding trains are associated with going to a particular place to do so. I enjoyed riding the subways and commuter trains when visiting my aunt in New York City. They are as much a part of that city’s identity as the buildings, Broadway, and the East and Hudson Rivers. My parents and grandparents also took me for rides on the Great Smoky Mountain Railroad in North Carolina, the Essex Steam Train in Connecticut, and to visit the North Carolina Transportation Museum at Southern Railway’s former Spencer Shops — each a location where the story of the place, and the people who shaped it, is interwoven with the story of the railroad. And for a time growing up, I could walk a few blocks from my father and stepmother’s big Victorian house in an in-town neighborhood in Greensboro, NC, on a trail through a small wooded area where once stood the house of a man who, I’ve heard, used to climb on slow-moving freight trains to ride into downtown. There, next to the big magnolia tree that once stood in the man’s front yard, I had a slightly elevated vantage point from which to see what was moving on the Norfolk Southern main line (the route of the Crescent). I used to marvel at how long the freight trains were, how big and loud the locomotives, and how many different kinds of freight cars I saw. I only rarely saw a passenger train there, as Amtrak’s Crescent comes through in the middle of the night. But part of the fun was walking through the woods to get there, sometimes following the sound of squealing flanges rounding the gentle curve the main line made in order to stay on the path of least topographical resistance. Woman gazing through a train window in Mexico in 2006. Photo by Flickr user Elly Clarke. As I grew older and started riding Amtrak often instead of flying or driving to see family, my initial sense of how train travel enhances one’s connection to the landscape was given fuller form when I read Allies of the Earth by Alfred Runte. Railroads are shaped by their surroundings as much as they shape them. The natural world is the source of all the raw materials that form every piece of the railroad, and the elements can be either a challenge to railroad engineering and operations or an aid to them. If North America’s topography and climate were more uniform, it would be a lot easier to build and run railroads. 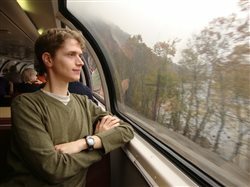 Not only do trains give passengers a more intimate view of the surroundings, by going places that roads cannot, but they also give passengers the time and space to appreciate what is presented to them through the windows. I feel that the fact that railroads are built in a greater rapport with the landscape than are roads and airports is key to what makes them so interesting to observe, model and travel aboard. Plus, a robust passenger train system fosters cities and towns that are compact and walkable, and thus have a more endearing character to them. These are the kinds of places featured in model railroad layouts, rather than the spread-out suburban development patterns brought about by an automobile-oriented transportation system. As we thrill in seeing or riding trains that take on steep mountains, dry deserts, deep snows and ocean waves, let us be thankful that such an immense variety of places exists, and that the providence of nature and whatever higher power you may believe is behind it all has made it possible for humans to reach and shape these places with a technology that works relatively in harmony with the contours of the land around it.